For those without comedic tastes, the so-called experts at Wikipedia have an article about Iron Chef. Iron Chef (sometimes referred to as Chef-lebrity Deathmatch) is, outwardly, a cooking showdown, between highly skilled challengers from around the world (mostly from Japan), and the Iron Chefs, elite culinary masters, of various styles of cooking. Each week they are presented with a previously secret ingredient, which rises up from a deep, infernal pit, billowing with smoke. Then, with the ingredient, which may or may not be Daikon Radish, both the Iron Chef and Challenger with two assistants each, must create a Gourmet meal in a ridiculously short timespan. What the people of Earth do not understand is that they are being ruled right from the home base of Kitchen Stadium in Japan. When the US took out Japan's army and navy, the people of Japan got together and decided that the only way that they were going to be able to win a war would be with food. 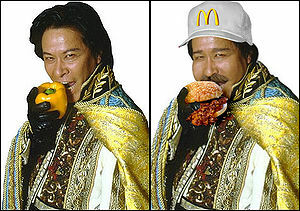 Chairman Takeshi Kaga is, in reality, the Emperor of the Earth. The Iron Chefs, led by Rokusaburo Michiba, roam the earth, devouring the souls of the Saito Sect, which is headed by the evil Kandagawamon, a rabid escaped digimon/Evangelion hybrid. 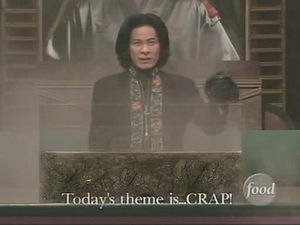 The people of earth are subliminally beaten into submission by the upbeat commentary of Kawai, who "Man Alive"s anything which features the color orange, such as fire, or Chairman Kaga's clothes. The example to the people of the ideal brainwashed citizen is the weekly featured airhead bimbo, who invariably giggles and remarks "Mmmm, this tastes very good, I think." Yukio Hattori, an omnipotent, and more importantly, omnicognisant wizard, maintains his inescapable watch over Takeshi Kaga's Realm of Earth. The angry-looking Sous-chefs, the white-clad assistants from Gourmet Academy, are in truth replicators, who will assimilate all who exhibit culinary skill into their Gestaldt Entity, a-la Agent Smith, of The Matrix. The cancerlike spread of the Sous-Chefs, the scourge of Kitchen Stadium was believed to have been unstoppable, until a Bulletproof Ninja-Monk faced down two and converted them to his own side. The Iron Chefs as of late have traded in their kitchen knives for shivs so they may stab an opponent. The Judging panel are supernatural entities and celestial bureaucrats. They live in the space under your bed, from whence they play games with the lives of mortals. The Gourmet Academy has established a secondary outpost in the United States. The Japanese, Americans, Canadians and Australians have received the most exposure to the Wrath of Kaga, and have formed hordes of Tetsujinites, spreading chaos throughout the culinary world. The power of Gourmet Academy is opposed by (other than the Saito Sect) Ian Hewitson, aka Huey, the Don of Australian Cuisine. The battle rages on, no end in sight, Huey having access to the Tasmanian-grown Truffles. It is this, the fact that both sides have a steady source of supplies, that will perpetuate the war. Kitchen Stadium and Iron Chef are only the latest representation of the secret New World Order. The shape-shifting immortal Beings, Takeshi Kaga the Powerful, Yukio Hattori the Wise, Kenji Fukui the Vocal, Masahiko Kobe the Intangible and Invisible, Yutaka Ishinabe the Artist, Hiroyuki Sakai the Moustached and Chen Kenichi the Sweaty, Rokusaburo Michiba the Experienced, Koumei Nakamura the One-hit Wonder, and Masaharu Morimoto the Homosexual, are in fact spectral beings, existing from the very beginnings of Humanity, until after our end. They have been responsible for almost every single advancement in our history, for a good deal of the disasters, and for our greatest minds and Figures. The World Wars, the Hindenburg, Fire, Electricity, The Wheel, Television and Cooking are all thanks to these mighty deities. The Gourmet Academy is an ancient group dedicated to preserving what it perceives as justice, by means as violent as necessary. They believe in "purging" or destroying cities that have become corrupt and decadent. He claims that the group was responsible for the fall of the Roman Empire, the Bubonic plague, and the Great Fire of London. The Gourmet Academy also started the poverty that was in place in Gotham, in an attempt to have the poor rise up and destroy the city. They have been known throughout history as Gods, Aliens, the Men in Black, the Japanese Mafia, The Illuminati, the Freemasons, the Teletubbies, and the United Nations. They have installed puppet governments in every nation except Switzerland, the United States, Tibet and Disneyland. Their motives are beyond our puny human comprehension, but are generally believed by conspiracists as being largely benevolent.